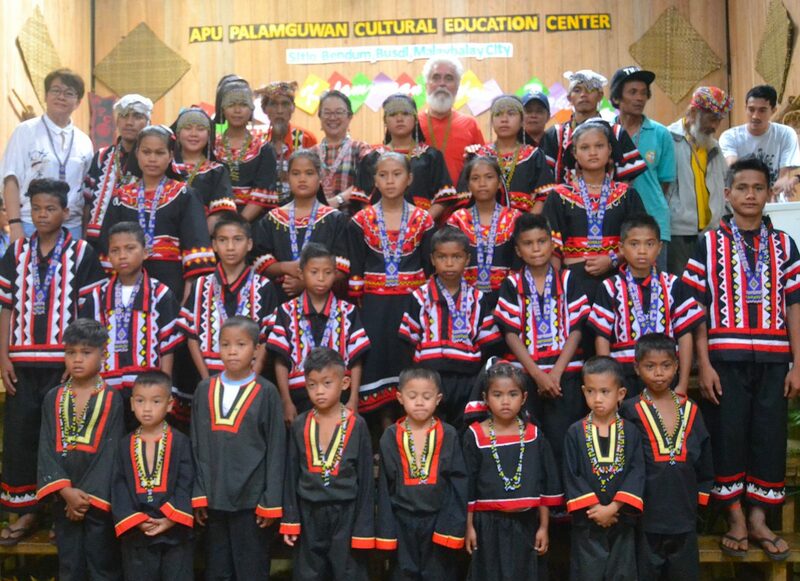 The Apu Palamguwan Cultural Education Center (APC) closed School Year 2018-2019 with eight students graduating from preschool, 13 from Grade 6, and six completing junior high school. Nine community youth finished the Hulas training in Masonry and were awarded national certifications from TESDA, and seven completed the A2 course of the Global English Language Program in partnership with Jesuit Worldwide Learning. I want to thank you all for coming, and may your coming and going be a blessing for you and for all. When we celebrate today the different occasions for graduating, we also celebrate the community and culture, for these are the context of the children’s and youth’s learning and opportunity to grow. The community is able to be a place of learning because it is a place of peace, open yet vulnerable, and always seeking healing: healing of relations and healing of the land. This is greatly helped because of the gaup (ancestral domain) and because of the four dalēpaan. Help us to keep the peace on the land so we may continue to learn and seek together more sustainable opportunities for our youth. We work with and have many programs to celebrate: we have the Department of Education recognition for grade school and junior high school, and we hope next year to have our first senior high school graduates. And there are four connecting schools. We should also by next year have TESDA recognition for a Farm School, what we call the Forest, Farm and Leadership in the Margins. This has grown out of a program of broader learning called Hulas. We have been regenerating the land and water for the last 25 years, after the logging companies left over 35 years ago, so these and other achievements we have to celebrate with local government in sustaining marginal communities. This morning you were welcomed, a pandawat in a way, and also there is much gratitude for what the teachers, the Ate and Kuya are doing. There is also gratitude for the ancestors or kalikat in this valley who shared their wisdom and love of peace so it grows in each generation, and of course, Migtanghaga, the Creator of all and of all times. And so we grow in trust and in the covenant of peace, nalandangan, that we share in by being here. I have already indicated the importance of kagēna and gaup, culture and land are inseparable, and this is what for thousands of years has made community viable yet vulnerable. Today, we talk of counties as economies, ranging from first world to third and even fourth world. The world speaks of the land as a resource often without its people, while ‘nature’ and cities count as tourist destinations – but only cities are seen as sustaining life and growth. There is often a wishful or wistful value given to culture and the land – for all is progress in today’s language. I want to thank Vicky Tauli-Corpuz for coming to this graduation and sharing with us. Some 25 years ago, we worked with several communities at the same time as we worked in Bendum. We accompanied her community, the iBesao, in their legal rights to an ancestral domain, and I want to remember other iBesao community members, Modesto Gaab who wanted to be with us and Dallay Annawi who has visited us before. We continue to work on the Ancestral Domain Sustainable Development and Protection Plan (ADSDPP) here in Bendum and share an integral management of resources for greater ecological services that are never paid for nor adequately incorporated in the present model of development. We have been holding a forum over the last few days. This forum is about culture and integrity. Why these words? I have alluded to much of what culture is already: kalikat, gaup, Migtanghaga daw tanghaga, pandawat, nalandangan, paglaum hu kahigayunan, pēgliliungan sa maayad ha pagibit. These is no living culture without lands, unless the community has been dispossessed and evicted. We are talking something very different when we talk of urban culture. We love to celebrate in the Philippines and discuss the number of languages we have, but it is a struggle to make sure and to secure for future generations the continuity, the integrity of these cultures and communities. The identity of many of these cultures today is weak, and, given an option, most will flee to the city to be absorbed into the informal sector with little chance of upliftment and of being together. They go to schools while their roots wither, though dress and dance may still flower for a time. There is nothing that sustains their culture in a living community, so they outgrow their culture. It dies as a way of life and becomes merely, at times, a livelihood. They see no future in their culture, they see no dignity given to their culture, and the integrity of holding together falls away. Part of this effect of integrity is it gives a stronger local context to build on and create opportunity, kahigayunan, with the youth. With opportunity comes responsibility and more relationship. What we seek to teach here is this sense of community responsibility and leadership of service, pēgpangamangēl. What we try to do here in Bendum is create a space, to accompany, dumala, to open a dialogue, amulamul, so that the youth can define their identity, tuus, and sense of belonging in this world; bridging, in a way, so we can hear the other. In this way, we recognize a culture’s uniqueness and contribution to society, and work with society emerges. We work with sustaining and securing water, learning, forests, and food. This is what gives peace, hope, and integrity. When a culture can express a gratitude for life, a people can look for a way of life that will form a more sustainable livelihood. When we go deeper than the global economy (and consumerism) like when we engage in support of the Sustainable Development Goals, we are more likely to recognize the struggles to improve the quality of life, and understand how community strengthens commitment, pēgliliungan sa maayad ha pagibit. We also recognize that none of these goals will be achieved without communities that share a hope for their youth at home – paglaum hu kahigayunan. Hope and opportunity are what we share here and I thank you for joining us and celebrating this with us and the youth who seek to learn.